After a 5 year, 1.6 billion kilometre journey, NASA’s Juno spacecraft is preparing to enter orbit around the planet Jupiter. NASA’s Juno spacecraft approaching Jupiter. Waiting on Earth is its science team, anxiously awaiting the radio signals that will confirm that Juno’s Jupiter orbit insertion manoeuvre has been a success. Taking that call will be four giant, super-sensitive antenna dishes located just outside Canberra. Managed by us, the Canberra Deep Space Communication Complex will be NASA’s prime station for this close encounter. As part of the US space agency’s Deep Space Network, Canberra, along with its sister station located in Goldstone, California, will provide unprecedented support. Between the two sites, nine antenna dishes will be locked onto Juno’s tiny signal, that when captured, is a billion times weaker than the power of a mobile phone. The Canberra Deep Space Communication Complex will lock four of its giant antenna dishes onto Juno’s signal. 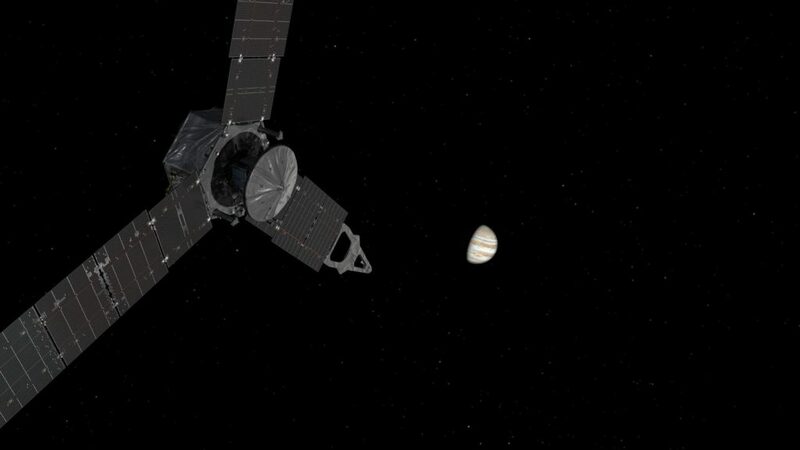 Those first signals received in Canberra around 2pm on July 5th, will confirm to NASA and the mission team from the Southwest Research Institute in San Antonio, Texas, that Juno has arrived safely in orbit. Juno’s mission is to study Jupiter from a unique polar orbit, repeatedly diving between the planet and its intense belts of charged particle radiation, coming only about 5,000 kilometres from the cloud tops at closest approach. The mission’s primary goal is to improve our understanding of Jupiter’s formation and evolution. The spacecraft will investigate the planet’s origins, interior structure, its atmosphere and magnetosphere. It will also help scientists to understand the history of our own solar system and provide new insights into how planetary systems form and develop in our galaxy and beyond. Located in Tidbinbilla, just outside of Canberra, the CDSCC has been in operation for just over 50 years. It is one of three of NASA’s Deep Space Network stations, used to provide continuous two-way, radio contact with spacecraft. In 1965 it helped to receive the first close-up pictures of the surface of Mars, taken by the Mariner 4 spacecraft. Since then, it has been involved in hundreds of missions, including the Apollo missions to the Moon, the Skylab space station, the early flights of the Space Shuttle and the landing of the rover Curiosity on Mars last year. Each day the antennas receive hundreds of gigabytes of data, including thousands of images, from dozens of spacecraft. For more information on Juno’s mission head on over to NASA’s official page here. The success rate of major scientific and technological undertakings is almost unbelievable. Take for examples those of NASA and JPL as presented by videos which accompanies this CSIRO blog, and also by institutions such as CSIRO. When did all this start? Perhaps in the 50’s, being not long ago. What might be achieved, say by one hundred years from now, is difficult to imagine.